Welcome everyone to the ultimate Robot links page! Add your web site today! Awesome models of Gort Robot from the Day the Earth Stood Still and Box Robot from Logan's Run await you at Astro Models! A PACKED web site with lots of superb vintage Robots for sale! An awesome retro soundtrack plays while you browse the site! A comprehensive range of innovative products, including high quality robot kits, controllers and accessories. A superb site! John Rigg builds amazing full size movie Robots! Brian Hayes web site is a magnificent information resource for Robot collectors. Be sure to visit! Fantastic developments in the Robot World. The future is now! Ever dreamed of owning your very own full size talking Robby the Robot? Get yours here! Excellent Robot reproductions from the golden age of Sci-Fi. The most amazing, detailed site covering all aspects of Androids. Construct the original bubble headed booby from Lost in Space! Looking for an original tin or plastic collectible Robot? Comet toys have a great selection. Superb and very interesting Robot kits available ranging from the beginner to the advanced. Everything you need to know about constructing the classic MST3K Robots! An excellent Robot from the Victorian era. This Robot is surrounded by an HG Wells type of atmosphere, wonderful! Be sure to check out this way cool miniature humanoid Robot! It is used to develop motion control and it looks absolutely wonderful! Calling all Gort fans. From out of space.... a warning and an ultimatum! A vast array of excellent collectible Robots from vintage to new. Meet the fantastic digital Robot dog from Sony. These wonderful developments are the shape of things to come. The supreme beings of the Universe invite you to construct your own Dalek! Wonderful radio controlled Daleks and talking Cybermen are now available! Learn all about this fabulous new humanoid Robot from Sony. It can walk, talk and even recognize you! Your plastic pal who's fun to be with! A character bios of Marvin. Lots of great Japanese Robots including such classics as Gigantor. Find out how you can construct your very own computerized android Robot head! Read all about this quirky Mechanoid from the super series Red Dwarf....Smee! A beautiful selection of classic, antique and contemporary Robots for sale! A UK based company developing Robotic technology with very interesting designs. Helping the Rebels restore freedom to the Galaxy, meet the fantastic R2! A very well detailed site including lots of great information from a huge private collection. A fantastic new Robot from NASA which is designed to work alongside astronauts in space! The excellent Protocol droid, fluent in many galactic languages! The most wonderful antique tin Robots are available. You want the real vintage Robots? You got em! A great selection of Robotic kits available to buy including some superb Robotic arms. Wonderful half size accurate Daleks are available. They're out of this World! An excellent site devoted to the magnificent Omnibot Robot! Fans of the Hero Robot should check out this dedicated site which has some superb information. Robert has a great site that includes his B-9 Robot collection from the classic Lost in Space series. A very cool site with a large selection of Robots for sale including the rare Masudaya 16" and 24" Robby! Wow! be sure to visit this site to witness an array of wonderful Electronic Robot sculptures and special effects, truly amazing! Learn all about the man who played the bubble headed booby in Lost in Space, most interesting! Superb reproduction Robots are now available with new items being released frequently. Check out the new Radar Robot! Offering superb Robots for hire with unique designs. The fantastic World of Robots and Animatronics awaits! JMC-21.COM presents one of the most fantastic movie Robot designs, in an awesome ready built and painted model kit! A great Japanese site. View the collection rooms and see some classic and contemporary Robots. The Award winning Jim Henson Creature Shop! The site explains the process of creating Animatronics, wow! Dreamers site is an incredible in depth look at many excellent images and sounds of Gort. Visit Ozzie's Robots today and witness some ultra rare antique Robots for sale. A brilliant site! Check out Clayton's wonderful full size metal Robot sculptures. Great designs with fun features! Fans of the ultra cool Cylons from Battlestar Galactica don't miss this page! Imagine owning your very own Cylon Centurion costume replica! Step into the great Robot galleries and view a variety of different Robots. They're all here! Chris has worked on some great Animatronic projects including his cool mechanical radio controlled head display. Club members share information on constructing their own Astromech R2 units, wonderful! UK based company buying and selling Robots on a Worldwide basis. Fantastic animal Animatronics, used in the TV and movie industry. Check it out! The fabulous Delos park is host to an amazing race of Robots. Learn all about the eerie gunslinger Robots of Westworld. Need a fantastic reproduction box for your collectible tin Robot? This is the web site to visit! An amazing glimpse into the genius World of Leonardo Davinci. This concept shows his awesome design for a mechanical man! The mighty Robots from the hit BBC TV series always battling it out for supremacy! An entire site devoted to these classic Robots. Great pictures and information. Absolutely FANTASTIC multilingual interactive robotic personalities for marketing, communication, advertisement and promotions. Our Robot friends from across the pond also do battle for championship status. Brilliant site which has many pictures of antique Robots from A-Z! Ross-Hime designs presents revolutionary Robotics including the Omni-Hand. This is the first truly dexterous robotic hand in history! The space age Robot....he's at your command! Read about the history and the future of this awesome Robot. Beautiful antique Robots are available from Zoomer. Lots of rarities from the golden age! The World of the eerie and the atmospheric blended with Animatronics! Check out some cool classic animation in this great site dedicated to the one and only Astroboy! Extremely detailed Zeroid page containing the Robots and ships. Which is your favorite? An extremely interesting site concentrating on the construction of reptilian Snake Robots. Check it out! Find out about the fantastic third movie in the Terminator trilogy. I'll be back! 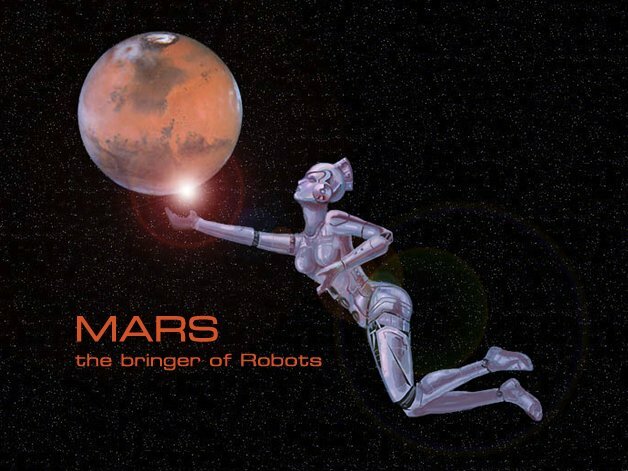 Offering a beautiful range of Robots and space toys. There's something here for everyone, don't miss it! Learn all about the fascinating Alpha AI Robot project which is a joint venture between CreatureBot Inc and AI Beings Inc.
An awesome look into the technical data from the World of the Terminator Robots. The intense detail in this site is wonderful! Those super cool rare original Robots are all here waiting for you. Lots of great antiques here. Check out the cool biomechanical AI Bugs, RC Cyber Panther and Cyber Spider! An interesting part of the makeup gallery which concentrates on TV & Movie Robots. A great place to compare various designs. Learn all about this wonderful collectible Robot from the late 20th Century! Amazing developments in miniature Robotics. The Cube Robot emulates real human movement. Check it out! The cutest Droid from a Galaxy far far away. This is a great site for information on everyone's favorite Astromech! Browse through this wonderful site and research the classic collectible Robots from the golden age! Offering a fantastic array of fun Robots available to buy or rent. Need a captivating promotional and entertaining device at that next trade show? Jeff explains all about this eerie, classic Robot from a movie far ahead of it's time! A brilliant selection of Robots for sale from classic tin to modern plastic. There's something here for every collector! An excellent selection of Robotic kits available including beginner, intermediate and advanced kits. Delving deep into the realms of the female Robot of Metropolis this in depth site studies the nature of the female Cyborg, fascinating! A cool site devoted to modern plastic Robots. These great designs are tomorrows classics! Check out this way cool experimental Robotic Shark! Designed and built in England Roboshark can get closer to Sharks and study them like never before! This marvelous Robot will captivate your imagination with all it's Robotic charm. Warner present their official site, cool! An excellent site dealing with great collectible Robots from all eras. There's lots to look at here. Check it out! Massive kits are available for you to construct your very own crushing, spinning, chopping "Robot Wars" style mega Robot! The advanced systems prototype from Cyberdyne spells disaster for our young hero John Connor. Robofolio explains the facts about this shape shifting menace! Welcome to Robot Island where you'll find some great original and reproduction Robots for sale! Check out this excellent online exhibition of the Worlds finest Robots and Robotics used in today's industry! Song writer Rik Daren loves TV and movie Robots with special fondness for Maria from Metropolis. Check out his cool web site! View Jay's incredible Robot collection including Gigantor, Robby and B-9 Robots! There's lots of great Robots to chat about at the Robot cafe. Robo cappuccino anyone? Introducing Mr. Zed - a time traveling android from the future. Check out the zany time line for some great fun! Producing some of the finest repro and original tin Robots on the Planet! Amazing fusion between man and machine! Beautiful art combined with technology, captivating and inspiring, it's all from the Robot Group! Full size Daleks and Cybermen await you...Doctor! These breathtaking display pieces are absolutely fantastic! A beautiful assortment of Robots, space toys and wind-ups are just some of the great items in store. Check them out! An abundance of Robot kits, parts and information await you. Make all Your Robot dreams come true with a little help from Mr. Robot. Visit the Robotski web site and discover some very rare items for your collection! The BBC Science department introduces many cool aspects of Robots to study and learn from in this fun web site. Explore the pictures and profiles of famous robots and inventors! Enter this cool web site where you'll discover over 1000 wonderful Robot and related icons. Don't miss it! Check out this cool Down under web site supplying a nice range of Robotic kits for education and hobby use. Concentrating on those superb Robots from the 1980's this site has masses of information and images to delight! A superb site which examines parts essential for Robot construction and inspiration for your Robot laboratory. Use the amazing Bryce 5, 3-D modeling program to create your very own posable model of Robby the Robot from the movie Forbidden Planet! A great educational site! Excellent stationery paper with a beautiful retro Robot design. Great idea for businesses! A very cool site featuring your favorite classic Robots in the form of video and puzzle games. Explore this site today for some great fun! Take a glimpse into the creative World of Petri Kiviniemi. His site demonstrates his passion for mechanical Robotic figures and other cool designs! Planning on constructing your very own Robot? Mondo-tronics have everything you need!